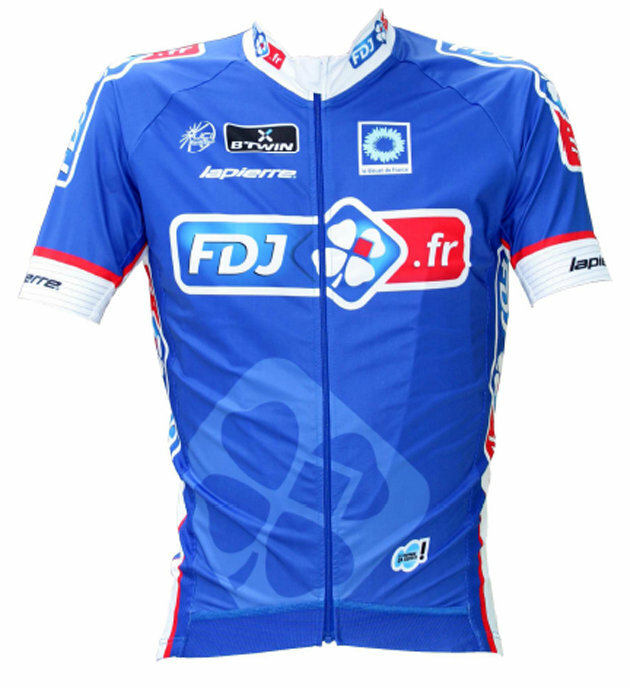 We love when teams announce their kits for the next season. We’ll bookmark this page in our top menu and post the latest kits as soon as we find out about them. Here is what we’ve seen so far for 2014. Yikes. The addition of more brown to the shoulders. 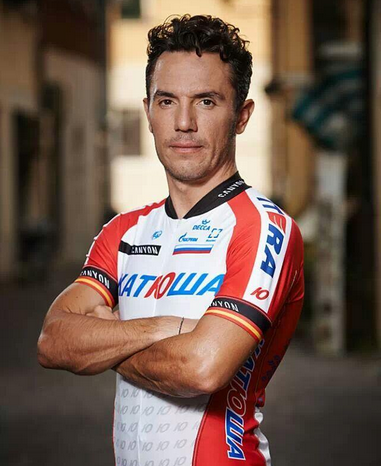 Poor Vincenzo Nibali. He’s going to have to wear this. 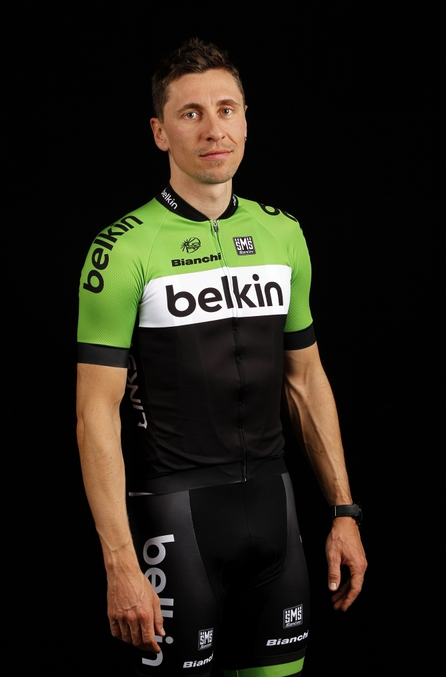 Belkin is rocking the green-and-black which looks pretty good but on the bike they have mixed the green with Bianchi ‘Celeste’ which is a crime. 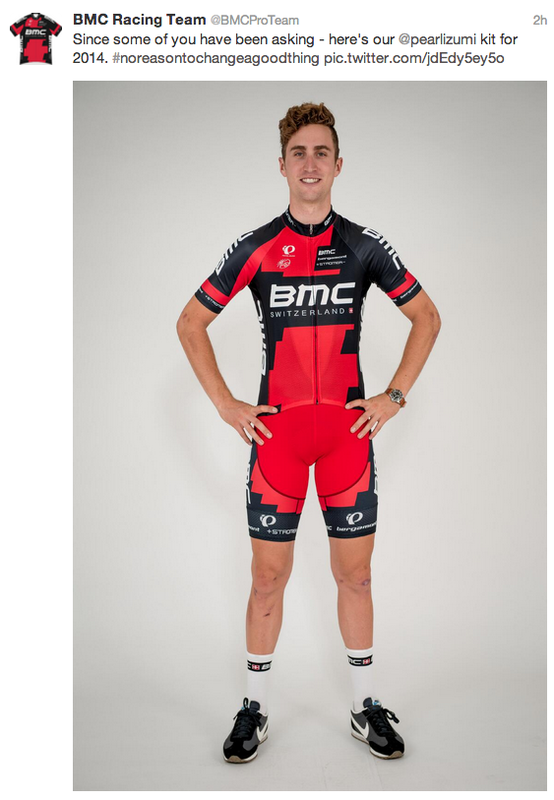 BMC announced that they will not be changing their 2014 kit from 2013. 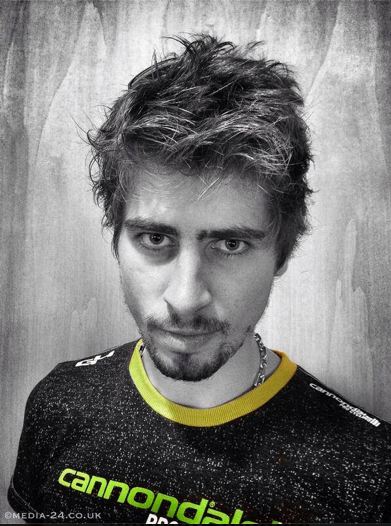 Taylor Phinney’s hair is ever-changing though. 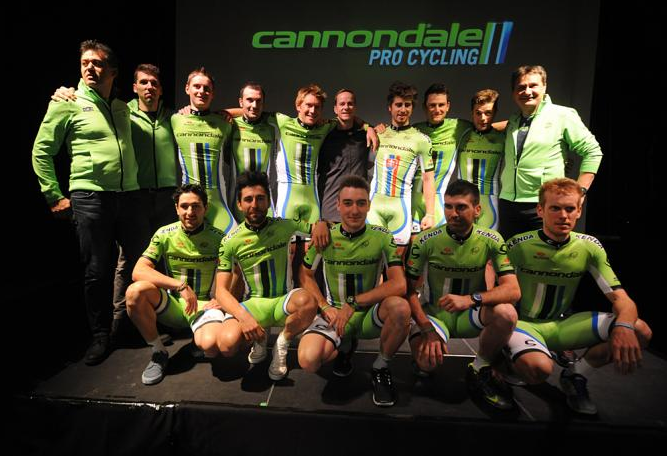 Cannondale launched their 2014 team in California. Kit hasn’t changed that much! 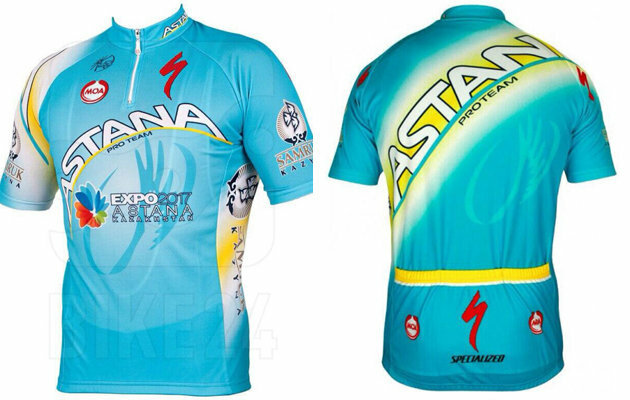 They also have a deal with G4 for their casual kit, including some natty tees. The clover leaf is becoming even more subdued. 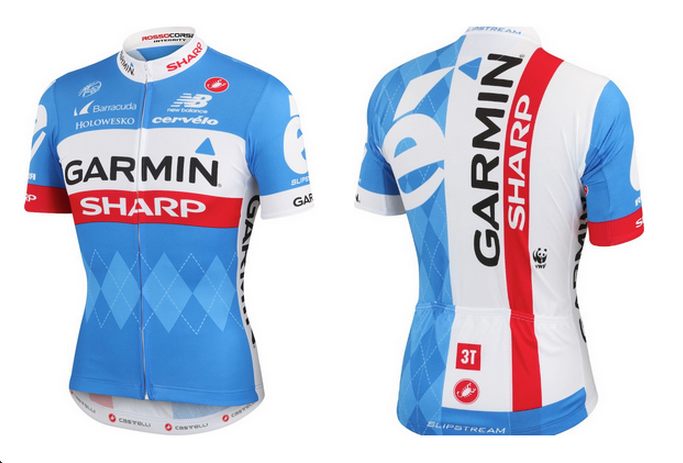 The 2014 Garmin kit is looking sharp with the addition of a Panda and a more graphic back panel for easy recognition from the air. 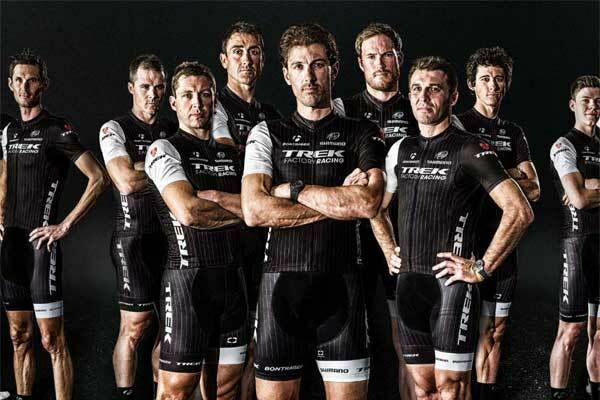 The team formerly known as Argos Shimano has changed names and added a lot of black. 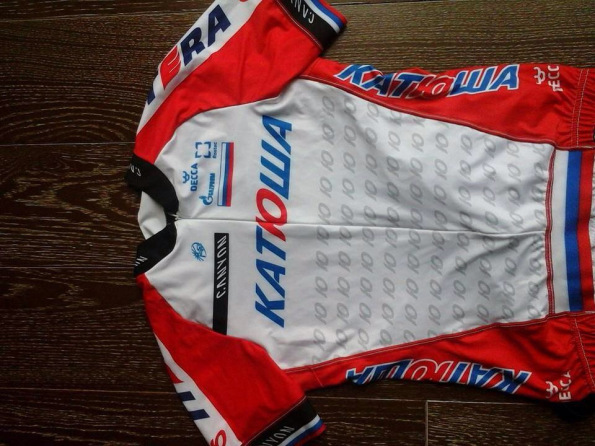 Katusha adds more white and whatever that Russian letter is. 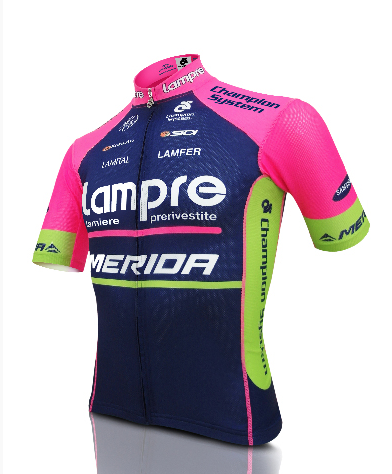 The pink-and-green remains but now Lampre have added a dark blue. 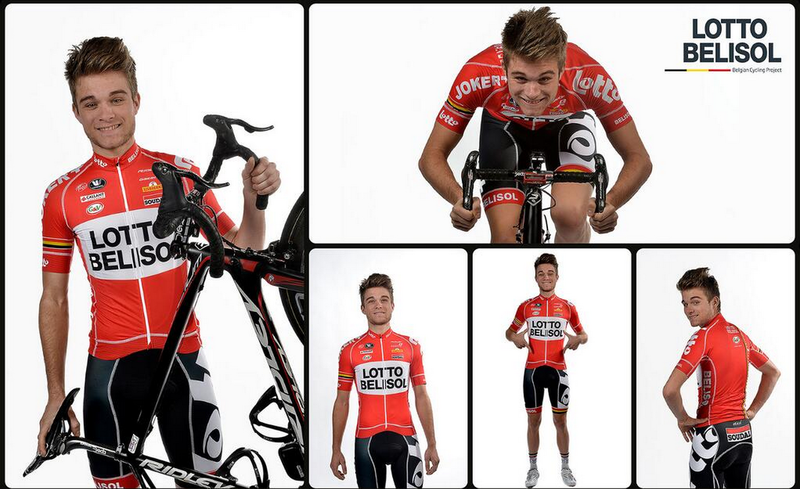 Lotto changing it up entirely with a new red look. 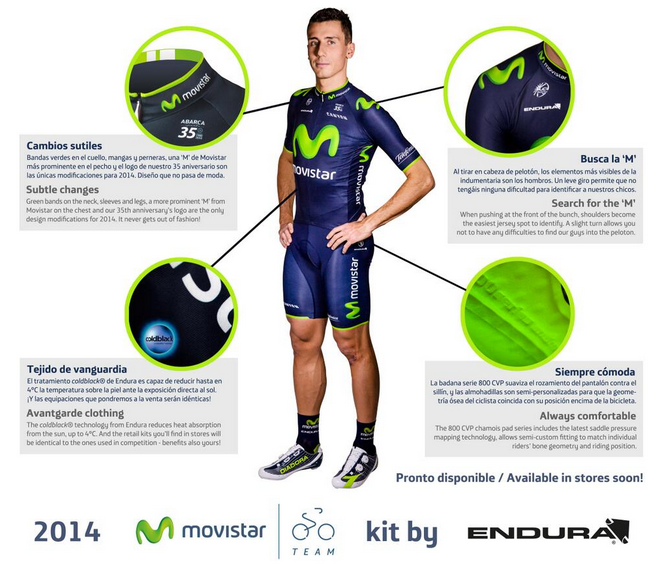 The toothpaste squiggle/glow-worm remains on the dark blue Movistar kit by Endura. 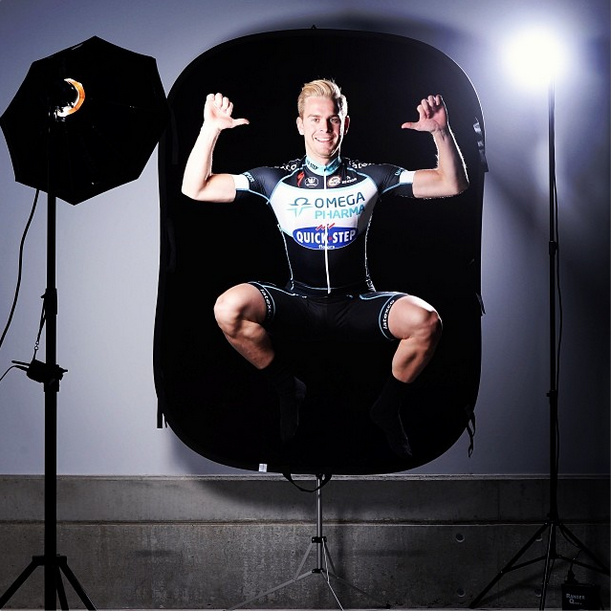 OPQS gives us a first glimpse of their 2014 kit with Julien Vermote (@julienvermote). More black. A bolder dark blue, touch of green, and white. Class. 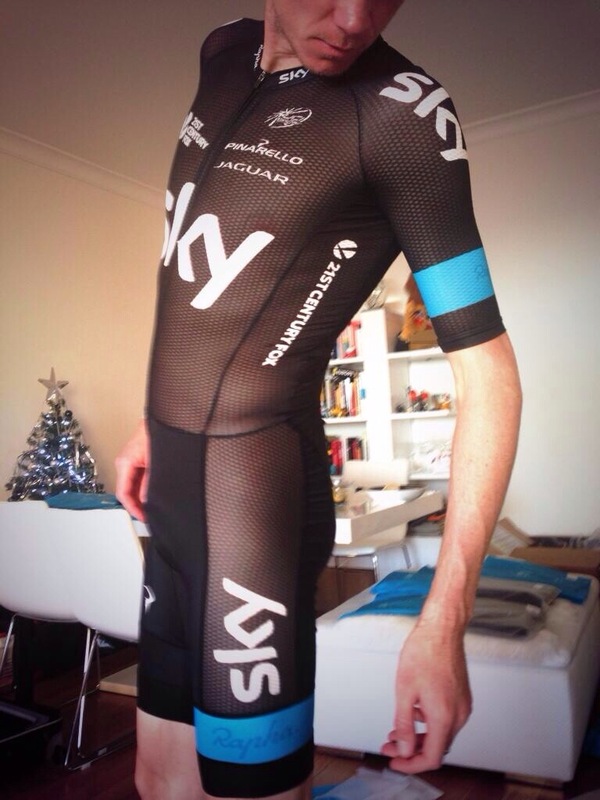 Chris Froome gave us a preview of the skin suit. For more on everyone’s thoughts on that read this special edition of Tweets of the Week. 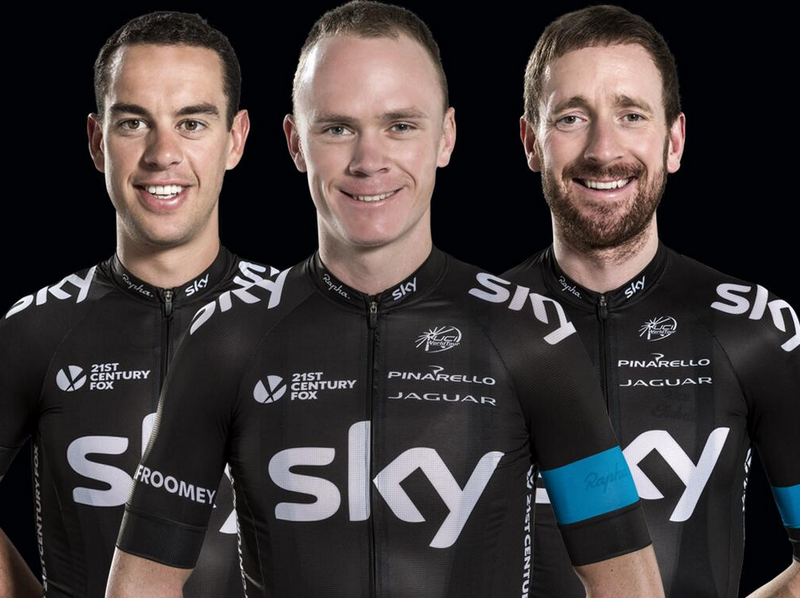 It looks like Sky have added additional sponsor logos but will keep the black, blue and now translucent. Too much black! 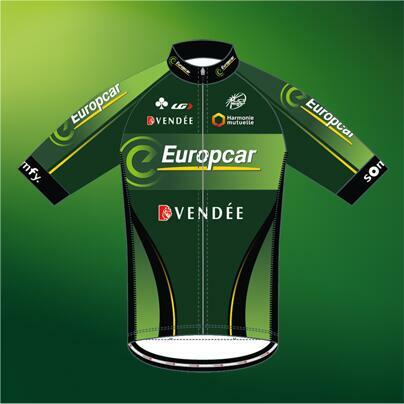 It’s like the peloton have gone colour blind. 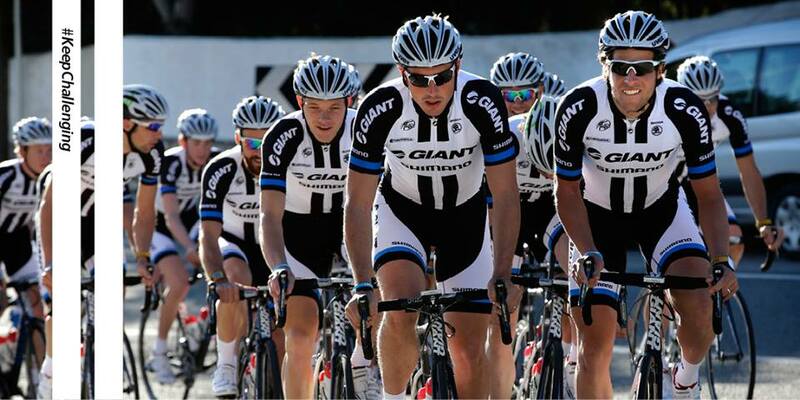 Imagine Team Sky, Trek and Giant all massed at the front… It’s enough to make me see red! (I’m here all week). 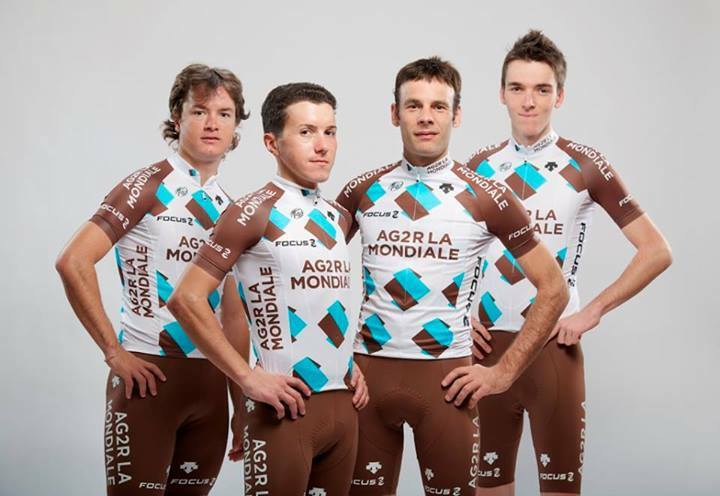 They look like zebras and that’s going to make Marcel look all grubby. 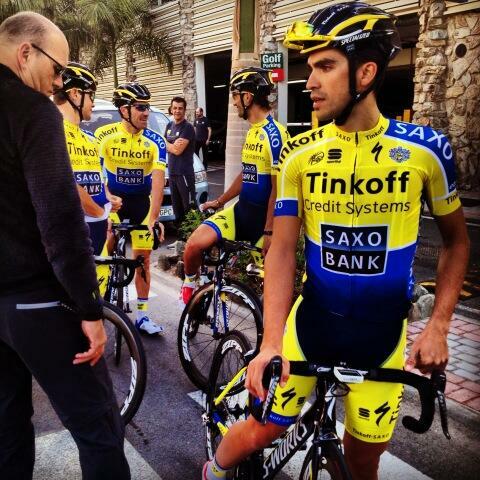 There should also be a ban on the over use of yellow (Tinkoff-Saxo-Saxo-Tinkoff I’m looking at you). 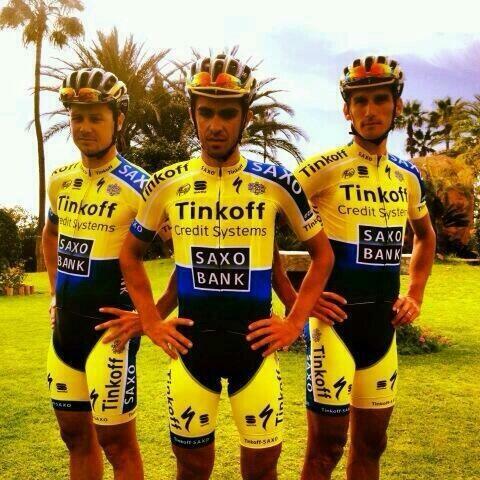 How the heck is le maillot jaune supposed to stand out? Thank god for lotto Belosol! 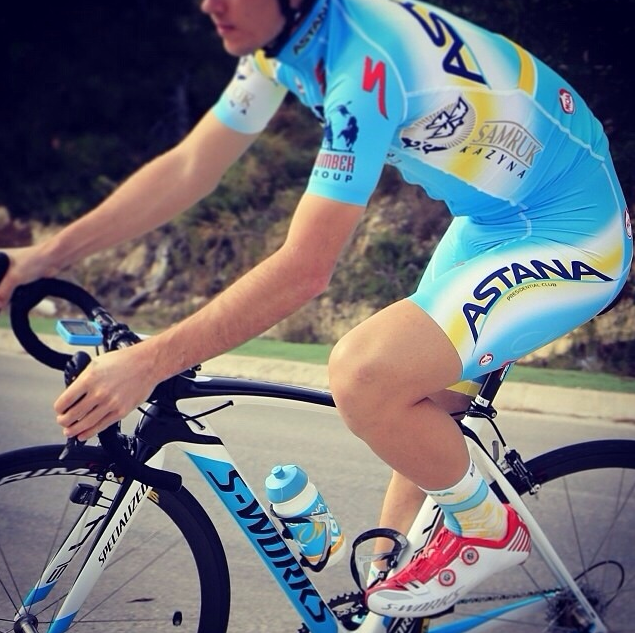 Very retro and reminds me of Saeco! I have been painting the peloton for almost a year now, and I am not happy about all of the black or the loss of the orange of Euskatel Euskadei. 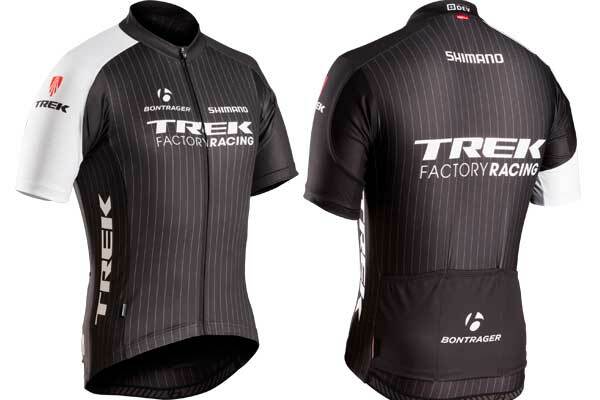 Black seems so wrong for riding in the heat of summer.